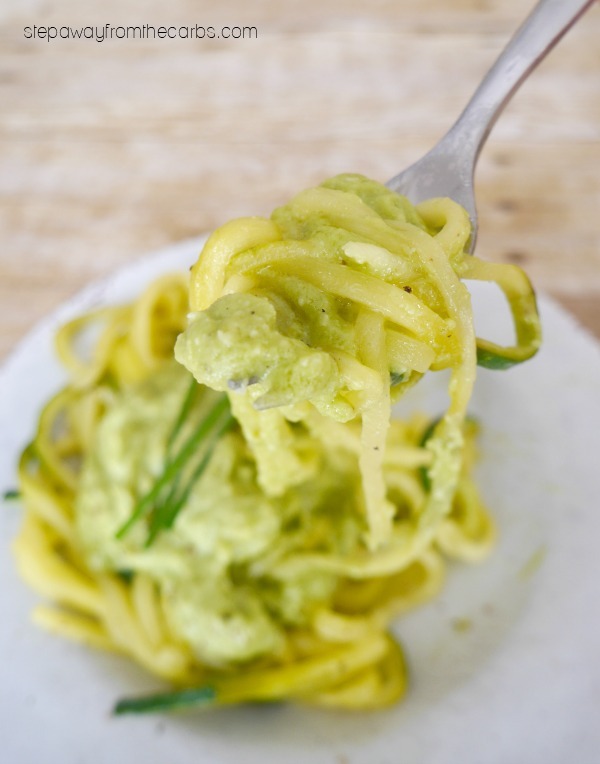 These zoodles are served with a deliciously creamy avocado sauce! 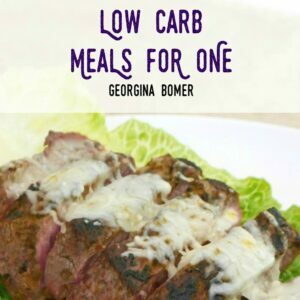 Low carb, LCHF, vegetarian, keto recipe. 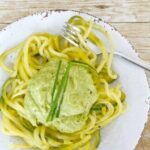 I’ve mentioned zoodles many times on this site – they’re so useful (and healthy!) 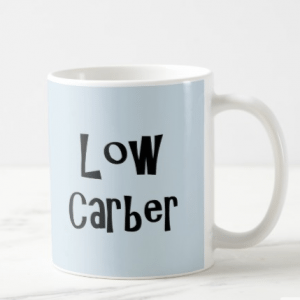 for us low carbers! 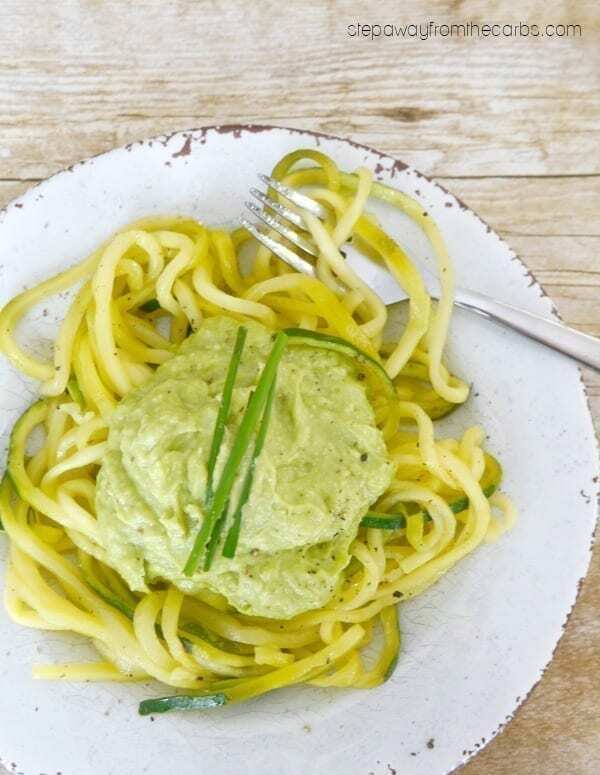 You can make them in various ways – with a julienne peeler, a spiralizer and in some grocery stores you can buy zucchini already prepared into noodles! 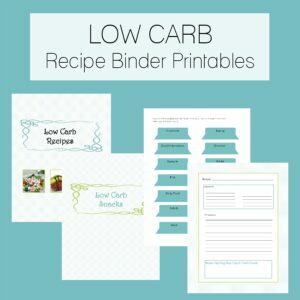 Buying them prepared isn’t the cheapest way – but it sure is quick if you’re short on time. The sauce just takes a minute or two to make, and if you have the zoodles already made then this meal can be on the table in about 5 minutes! The creamy avocado sauce may look like guacamole, but with the addition of Parmesan it really tastes more like an Alfredo sauce. And you know how much I love my decadent Alfredo sauce! I prefer to have quite a lot of sauce on my zoodles, but if you prefer a different ratio you could make this sauce stretch between three or even four servings of zoodles. Either way the sauce combined with the zucchini noodles is comforting with a great mouth-feel. You’re going to love it! 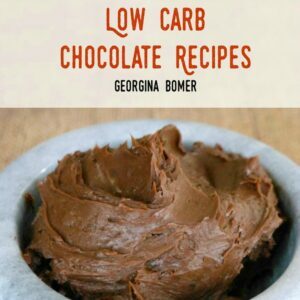 To make the sauce, add a fresh avocado, garlic paste, heavy cream, grated Parmesan, and lemon juice to a food processor. Blend until smooth, then taste for seasoning – adding salt and pepper as necessary. Heat some olive oil in a large skillet and add the zoodles. Sauté them for just a few minutes, then season them with more salt and pepper. Serve the zoodles and top it with the sauce. Or you can mix the sauce in with the zoodles if you prefer, but just remove any remaining oil or liquid from the skillet first before you toss it all together. I’ve served it here with a few chives, but fresh basil or parsley would also work well. 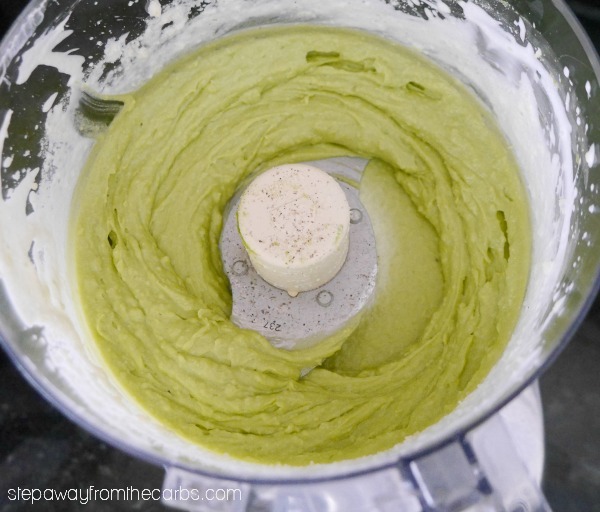 To make the sauce, add the avocado, garlic paste, heavy cream, grated Parmesan, and lemon juice to a food processor. Blend until smooth, then taste for seasoning - adding salt and pepper as necessary. Heat some olive oil in a large skillet and add the zoodles. Sauté them for just a few minutes, then season them with more salt and pepper. Serve the zoodles and top it with the sauce and garnish with fresh herbs. 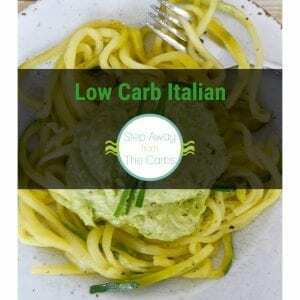 Honestly, one of my top “pasta” dishes I’ve EVER tasted – low carb or not. AMAZING! I’m so glad you enjoyed it, Jackie! It’s one of my favorites, too!